Welcome to my April 2016 Monthly Income Report! Each month I construct a brand new detailed report that covers the latest goings-on across all of my online businesses, including wins, failures, lessons learned, and exact dollar amounts from each of my income streams. If you’d like to get a snapshot of my income growth over time, and a list of all of the previous income reports I’ve published since I started doing these back in 2008, please visit my income reports page. If this is your first time seeing one of these reports, you might be wondering why I take the time to write them up. Or, even further, why I choose to reveal my income details publicly here on the blog. I see it like this: It’s sort of like how companies in the stock market publicly report their earnings. They do this so that their investors can understand how the company is performing, and can have the clarity decide whether or not to continue to invest based upon its performance. You’re not investing your dollars with me like in the stock market, but you are investing your time, and in order for you to understand whether or not this is the place for you to spend your time, especially because it’s a resource that can potentially help you in your own online business journey (and this stuff doesn’t happen overnight), I felt the need to be completely transparent. I appreciate your support, time, and attention. It’s my job to make sure everything, including me and SPI as a whole, well worth it for you. So without further delay, let’s get right into this month’s report. April was huge. After months of designing and planning, the brand new redesign of The Smart Passive Income Blog was revealed! 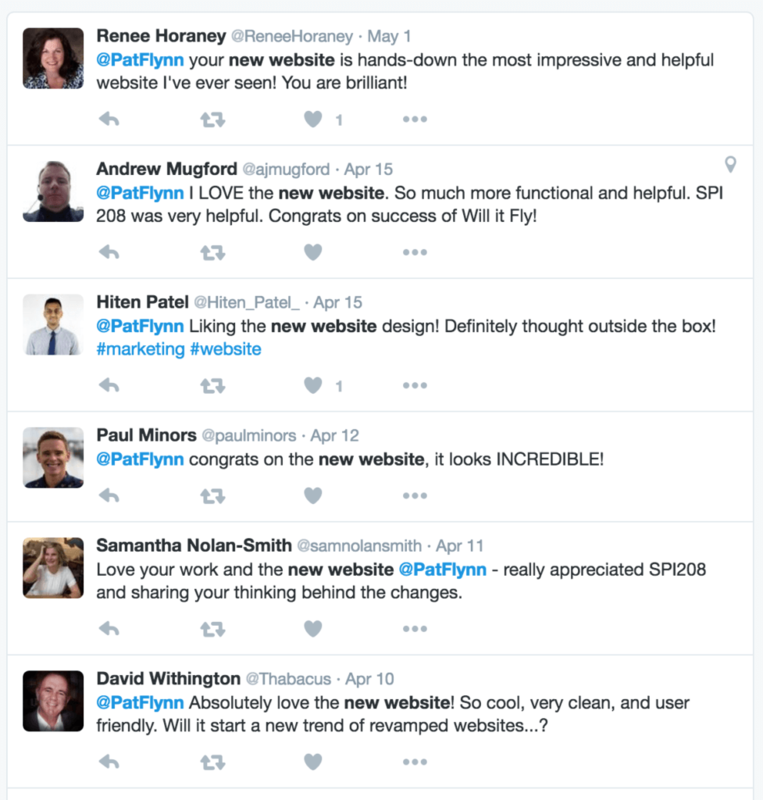 The redesign is a massive change from the previous iteration. Before we flipped the switch, I took a short trip to Columbus, Ohio to visit my development team, which is where most of them are headquartered. We stayed up late into the early morning for a couple of nights to get things finished, and by the time I headed back home we were very proud of what we accomplished together! This was my second visit to Columbus, and I’ll definitely be back again. It’s beautiful and the food is amazing! Big kudos to the entire team for their hard work getting everything put together. The one thing I will say, however, is that I didn’t do as well of a job setting my audience’s expectation on what exactly would be ready by the time the new site went live. As long as people are respectful, I always encourage, listen to, and appreciate negative feedback. Your constructive criticism over the years has accounted for several improvements here on SPI, and has helped me stay on the right track. And with a redesign, as with any changes that are made after something has been a certain way for a long period of time, there will always be negative feedback, and I had expected some of it. Nothing was too drastic, but a lot of the negative feedback was a result of some of the archived content in the podcast and income reports not being readily available in the new design, which happened because, frankly, it wasn’t ready yet. We set a hard date on the redesign launch, and in order to meet that deadline we had to put a few things on hold. For the podcasts and income report posts in particular, which feature a new look and post-type, it took a little longer than expected to convert those posts into the new designs. I should have done a better job of letting people know ahead of time, at least to avoid missed expectations. There were a few people who were not too keen on the new design in general, which is natural and expected. The one thing I’ve learned after redesigning the website several times in the past is that you can’t please everyone. On the other side, for every negative comment, there were dozens of positive comments. Overall, much of what has been said about this site has been very valuable and will all be taken into consideration. We’ve already made some changes, and more are coming, so thank you! And if it’s anything like with the previous redesigns, after a few months, no one will question the change anymore and people will continue to enjoy it. 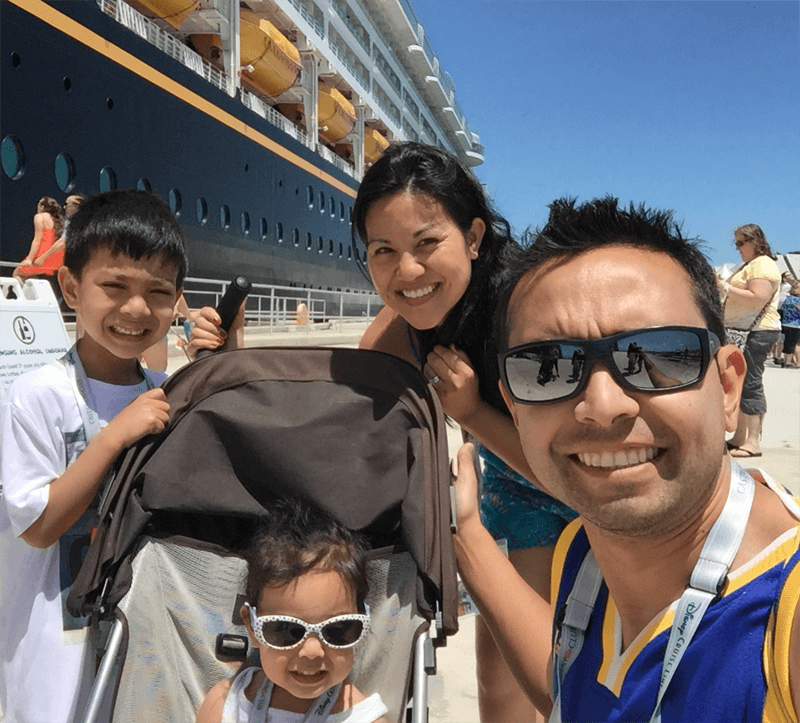 After the craziness of the redesign launch, I was excited to spend some time away from work with my family on a Disney Cruise! This was our second one, but the first time we went our son was only three, and our daughter was a one-year-old baby. This time, they were six and three—much older—so it was definitely going to be a lot different, and hopefully even more fun! This time, our youngest was qualified to join the “Oceaneer’s Club,” which is like an onboard daycare (more like a mini-Disneyland actually) for kids aged three to twelve. We were curious to see if she’d enjoy it since this was really the first time we’d be away from her in a preschool or daycare-type situation (both of my wife and I are at home with her all day), but after a quick tour of the games, crafts, and activities, she never looked back! Both her and her brother were very happy there, which made Mommy and Daddy very happy too. Quite honestly, we haven’t had this much free alone time since the kids were born, and my wife and I were able to have some quality time together knowing the kids were safe. All in all, it was a perfect trip! We stopped in Key West, Cozumel Mexico, and the Cayman Islands along the way. We had some beach time, ate some amazing food, and we’re already planning our next trip! It was amazing! Back from the #DisneyCruise! Epic family trip, can’t wait to do it again! Back to San Diego tonight and then speaking at #smmw16 tomorrow! I always learn so much from my Disney experiences. This one in particular I realized just how much detail they pay attention to, especially as it relates to the Disney cruise employees who interacted with us more than once. Our waiters, who followed us from restaurant to restaurant each evening for dinner, learned so much about us during the week. They learn the kids’ names, asked them questions about things they like, and even predicted what we wanted to order from the new dinner menus. It’s truly a magical experience, and it’s just simply paying attention and personalizing the experience that makes it all happen. I enjoyed the cruise so much that I changed part of my Social Media Marketing World presentation to talk about the experience. The day after my family and I got back from the cruise, I had to get quickly back into work mode because Social Media Marketing World (SMMW16) was underway in San Diego, and I was scheduled to speak! I spent the plane ride home rehearsing and practicing my presentation (and updating my slides to add in some of the cruise experience). I was excited to have an excuse to get right back into work mode because sometimes if I don’t have anything major to do, I get a little lazy after long vacations like that. It was great to see a lot of friendly and familiar faces back in my hometown, in the heart of downtown San Diego. But as I always do, I try hard not to get distracted and lose focus before I speak. Then, at 2:00 p.m. on Monday, April 18, I was on stage! In this presentation, I reveal how I surveyed my audience and divided them into three buckets that allows me to serve up unique content to them, and how that has made a dramatic increase in open rates, click-throughs, as well as a more satisfying user experience across my entire brand. It was great to experiment with new content on stage, because for the last year I’ve been presenting material that I’ve done before. As much as I like doing that since I get to hone in on what works and what doesn’t around a particular topic, I also love trying new stuff for the first time. It’s always exciting because you never really know how the crowd is going to react until you do it. I was extremely happy with the response from the presentation. Throughout the rest of the conference, I had several people come up to me complimenting the content, and the best part is that they said it was very actionable, clear, and exactly what they needed. I definitely plan on doing this presentation again at some point—if not in person, then in a webinar for all of those who can’t attend. Later during the day, I watched Gary Vaynerchuk give a presentation (which I always enjoy), and then I hung out with my bro Chris Ducker, who was in town for the same event. It’s always a pleasure when your best friend comes to town. Honestly, he doesn’t do it enough, but when he does come by it’s always a blast. We just hung out in his hotel room and had dinner with his son. The next day, Chris and I spoke on a panel together alongside Lou Mongello and Lauren Gaggioli for a fun chat about the business of podcasting. With a packed room, the time flew by. I think we could have been in there for hours and enjoyed every moment of it. It was a fun group to speak with, a great crowd, and I only wish I could do that more often. The rest of April was spent catching up on content that I fell a little behind on during the week of SMMW16. I cranked down on blog posts and podcast episodes (and especially on AskPat to get another month ahead), and I must say, it’s nice to start the month of May fresh again with new things coming up on the horizon, including more updates to the current web design, keynoting the Everything Food Blogger Conference in Salt Lake City, and major planning related to an upcoming course. More on that soon. But for now, let’s get into the income breakdown for April 2016! The new redesign being the big event in April had me thinking a lot about making progress and pushing the envelope. Much of what was incorporated into the new website redesign was done to not only better serve you, but also to push the envelope when it comes to web design and content personalization. When I think back to when I first started out online, to have a site like this and an audience of this size and support would have been a dream. But none of this happened overnight. It took steps, one leading to another, and this eight-year journey has been a wild ride full of mistakes made, lessons learned, and remembering where I came from to make progress onto the next big thing. Going to the big thing from the start almost seems impossible, but moving step by step, and being patient while also being proactive instead of reactive is the way to grow. And here’s the big lesson to sum that all up: what got us here won’t get us there. We always have to be thinking bigger, better, and further into the future. Although this is about passive income and letting things run on autopilot, I think there’s a danger that comes with this kind of thinking that we all have to be aware of. What passive income can give you is flexibility and freedom, but not infinite flexibility and not infinite freedom. It’s enough to choose when you want to work—but you still have to work. It’s enough to have the freedom to take a vacation with your family without thinking about how it might impact your work or schedule, and have the business continue to run, but you still have to get back on that schedule at some point and get back to work and move onto the next thing. In order to keep things going, you have to think bigger and keep being aggressive with making improvements. Complacency is the enemy of progress, so don’t settle with what you have, ever, but also be smart with how you use your time and where improvements can be made. A lot of what was done here, and will continue to be done here is a result of you and your amazing comments, emails, and messages. Thank you, all of you, for your support. I will continue to serve you here on SPI, and do my best to make learning this world of online business a better experience. I appreciate you!